(SOLVED) Testcases: How to show more than 10 results in the Test Records field? with the dropdwon menu of the test record section in a test case? The attached screenshot shows more precisely what I mean (if the attachment it is not visible, see it here instead: https://abload.de/img/testcases_maximum_numpvpkp.png). 1.) A wiki page in which you fetch the test records of a test case with the TestManagementsService class, like described in this thread. 2.) Creating a Java application in which I fetch the test records with the help of the TestManagementWebService class of the Polarion Web API. HOWEVER I want to this do with the dropdown menu only and I wondered if it possible to overcome the limitations it has by simply editing this menu. 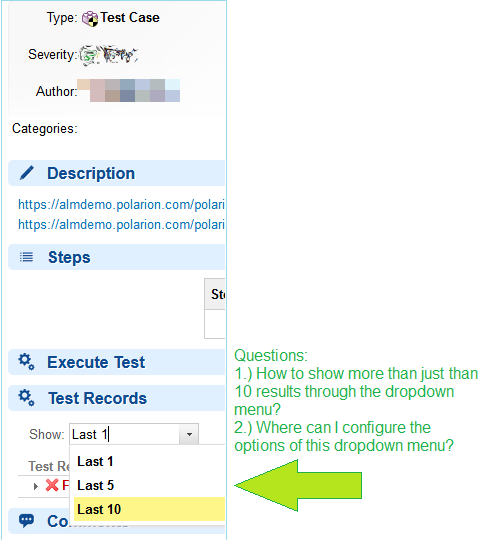 Polarion Testcase with test records dropdown menu. Is it possible to modify the dropdown menu to show more results? Last edited by ALMighty on Mon May 07, 2018 6:10 pm, edited 3 times in total. Re: Testcases: How to show more than 10 results in the Test Records field? go to Administration -> Work Items -> Form Configuration and select your Workitem type (Testcase). mhoe wrote: go to Administration -> Work Items -> Form Configuration and select your Workitem type (Testcase). Withyour hints I could modify the dropdown field. Could it be that the test records field has still another limitation though? in Polarions database, yet when I try to select 30 with the dropdwon menu it still shows 28. Is it possible to edit the "Execute Test" field (see attachment section) also, like adding a filter for testruns or show the former results of each test step?